Take Me, I’m Yours Blog Tour – here’s how it went. 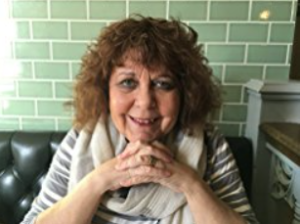 Anne Williams said: I had the pleasure and honour of being an early reader, and sharing my review on publication day – you’ll find that review again here, and I suspect you might just pick up how very much I enjoyed it. Deborah wrote: I was hooked from the moment India picked up the monkey wrench, determined to defend herself, if necessary, from the bullying Logan – and I did not want to put it down. I thought all of the characters were totally believable, and the plot twists and turns kept me reading, long into the night. September 16th Jerra’s Jamboree posted an extract from Take Me, I’m Yours. 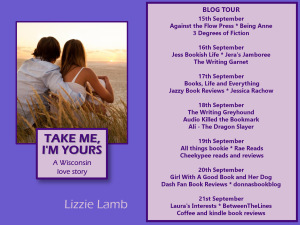 I apologise for the…49 minutes lateness, however I am excited to be promoting Lizzie Lamb’s new novel as part of my stop on the blog tour! For several years I wrote a book blog and accumulated reviews of some really good reads. I saw on Twitter that Renee at It’s Book Talk started using the #ThrowbackThursday meme as a way to share books that are old favourites or have been waiting to be read for a long time. I decided to visit my old book reviews and re-post my favourites here on 3sixtyfiveblog for #ThrowbackThursday. and Boot Camp Bride by Lizzie Lamb. This week it’s the Heartfelt Series by Adrienne Vaughan. The Heartfelt Series is a trilogy of romantic novels each one of which is difficult to put down! This week it’s Boot Camp Bride by Lizzie Lamb. Boot Camp Bride is romantic novelist Lizzie Lamb’s second book but it was the first of her stories I read. After teaching my 1000th pupil and working as a deputy head teacher in a large primary school, I decided pursue my first love: writing. I joined the Romantic Novelists’ Association’s New Writers’ Scheme, wrote Tall, Dark and Kilted (2012), followed a year later by Boot Camp Bride. Although much of my time is taken up publicising Tall, Dark and Kilted and Boot Camp Bride, I published a third novel SCOTCH ON THE ROCKS in July 2015. It achieved Best Seller status within two weeks of appearing on Amazon. I am a founding member of an indie publishing group – New Romantics Press and have held an Author Event at Waterstones High Street, Kensington, London. This week I’m showcasing Boot Camp Bride by Lizzie Lamb, a contemporary romance and mystery, published in 2013. Aspiring journalist, Charlee Montague, is desperate for her big break. The story that will make people sit up and take notice, especially her ultra successful family. In the meanwhile she is an intern at the celebrity orientated What’cha magazine, owned by Sam Walker, the father of her best friend Poppy, where she is given the worst of the menial jobs. Category: Romance, Contemporary, Mystery, Book Review, Books, Reading. Her academic career in tatters, Dr Henriette Bruar needs somewhere to lay low, plan her comeback and restore her tarnished reputation. Fate takes her to a remote Scottish castle to auction the contents of an ancient library to pay the laird’s mounting debts. After a show of justified outrage with unfortunate consequences, Doctor Henriette Bruar with the help of Professor Maddie Hallam, has secured a job cataloguing the library at Castle Tèarmannair. She is hopeful of finding some valuable books; to secure funds for restoration of the castle and, hopefully, in the process also help her career. Her position as an academic and possibly furthering that position at St Guthlac’s is now in jeopardy and time away, giving Henri chance to try and repair the damage, is just what she needs.